The cutman is indispensable to combat sports. A good one adds a veneer of civility to a brutal affair by reducing swells and stopping blood. He can extend a fight for an extra round or more, armed with nothing but vaseline, a cold piece of metal called an enswell, and a chemically soaked Q-Tip. But the cutman is often underappreciated. He’s a background player, easily missed by most fans. He’s a sideline guy, taken for granted in a fight where no one bleeds. The cutman is “the biggest scam in boxing,” the trainer to the heavyweight champion of the world says, mere days before the champ loses his title in a fight where he gets cut. The best cutman in MMA criticizes the endorsement deal his league has signed. Within days, he is fired, after 14 years of doing what he does best. The cutman reminds one of old man Brockway in Ralph Ellison’s Invisible Man, who mixes the paints in the basement of the Optic White factory. What he does is integral, but the glory goes to the final result and presentation. Everyone can do without the cutman until he or she really needs him, until he saves the day. There’s enough evidence out there; you don’t need a video game to really make the point that the cutman is an undervalued, underappreciated asset. You could just watch Buster Douglas’ 1990 upset win against Mike Tyson; his overmatched corner was forced to use a latex glove filled with ice water on Tyson’s puffed-up face. Before each fight, you chose a cutman. You had a choice of three different guys: a bum who was free, a guy who specialized in reducing swells (somewhat expensive), and a guy who specialized in stopping cuts (prohibitively expensive). You had to choose wisely. If you were fighting a tomato can, you might have saved your money. But if you were taking on a fighter above your skill level, you had to anticipate the inevitable brutality. The cutman mini-game gave you 30 seconds to heal all of the damage on your fighter’s face. There were two types of damage: swelling and bleeding. For swelling, you applied an enswell. For bleeding, you applied a Q-Tip. Your face was divided into quadrants: left and right cheeks, and left and right temples, and each quadrant had a damage meter. To heal, you selected which tool you wanted to use, and then rolled your thumb in an arc using the control stick. Your stick controlled the position of a white tic mark in a curved meter. By keeping the mark within a window that moved through that meter, you slowly healed your fighter’s face. You only had half a minute. If you were strong on defense during the prior round, you could easily get your face back to 100% If you took a lot of punches, however, there was no way that you were going to heal all the damage in such a short amount of time. You had to make decisions about the cuts. Were you going to reduce the swelling so you could see out of your left eye? 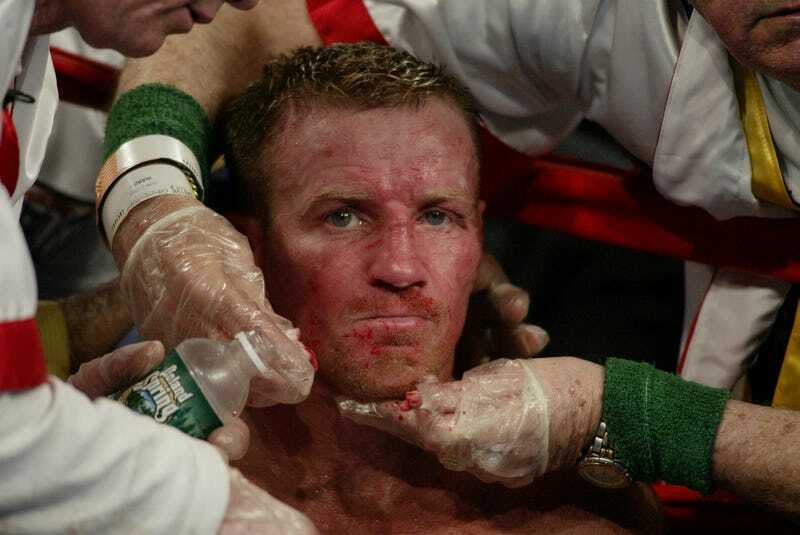 Were you going to stop the bleeding on your right cheek so that the ref wouldn’t call the fight? Priorities, priorities. A sense of panic set in as you tried to patch things up. You got a feel for a cutman’s urgency, his stubborn determination at odds with inevitability. You can’t keep repairing this broken face forever. When your fighter staggered back to the center of the ring for the next round, you knew exactly where you were weak, and where you were not. You felt vulnerable. True to life, you tried to protect those areas and survive the round, so that you could make it back to your corner and continue the healing process. This simple mini-game affected the psychology of the fight, and ensured that there was never a dull moment. The developers of Fight Night Round 2 created a side-activity that you looked forward to and wanted more of. Ironically, for a game where fighting was the primary objective, a thirty second break from it wasn’t nearly enough. Since Fight Night Champion, EA Sports has focused its attention on the UFC, and its MMA titles also have no cutman mini-game. EA Sports UFC didn’t have one. And it doesn’t look like the upcoming EA Sports UFC 2 will have one either. Cutting the cutmen from combat games is a wasted opportunity, because in real boxing, there is nothing relaxing or dull about the rest time between rounds. It should not be a time where we’re impatiently pressing ‘Square’ to skip forward. Instead, it should feel like the pitstop at a Nascar race. It should feel like a harried cluster of people, each with a different role: a trainer who’s spewing a combination of advice and positive reinforcement, a ring doctor who makes sure the fighter can go another round, and of course, the crucial cutman in the midst of it all, who’s patching up the fighter’s face so the ring doctor doesn’t call the fight. The cutman is part of the scrappy, underdog narrative that makes boxing great. The late legendary cutman Joe Souza, learned his craft the hard way, before hard science and methodology took the place of do-it-yourself scrappiness. In an interview with ESPN, Souza’s wife recalled that Souza would cut himself in their kitchen and test his remedies on himself; he created them by mixing different medicines from the local pharmacy. Souza was instrumental in the careers of many boxers like Arturo Gatti, whose angular features made him an easy bleeder. Known for his ‘come-from-behind’ theatrics, Gatti would never have been able to last into the later rounds of his most famous fights if it wasn’t for Souza. Because a cutman’s work is so messy, and because a cutman’s entire purpose is to make his job seamless, his hard work is easy to overlook and marginalize, at least to the lay observer. In real life and video games alike, those unsung heroes should be recognized as more than ‘part of the entourage’ and as more than something to ‘get out of the way’ in order to get back to the good stuff. We don’t want our favorite fighters to be superheroes; it’s their humanity that draws us in. And interactive moments in sports games, such as the cutman mini-game in Fight Night Round 2, allow us to identify with our chosen fighters, empathize with the guys working on their cuts, and appreciate their victories over hardships.